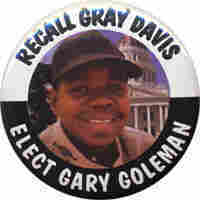 A Very Different Stroke: The Gary Coleman For Governor Campaign : It's All Politics Remembering Gary Coleman, who died recently, and who ran a mostly-forgotten campaign for governor of California during the recall election of 2003. There has been lots of attention and interest, deservedly so, in next week's Republican gubernatorial primary in California, where Arnold Schwarzenegger (R) is barred from running again. And with the recent passing of actor Gary Coleman, it brought back memories of another famous California race, the 2003 recall battle that ended Gray Davis' (D) tenure as governor. As recounted the other day by NPR's Mandalit del Barco on The Two-Way blog, Coleman was, believe it or not, one of 136 candidates on the ballot as alternatives to Davis. Davis, as we all know, was recalled, and Schwarzenegger won the job with 4.2 million votes. Eighth place went to ... Coleman, best known as the star of the 1970s and '80s TV sitcom "Diff'rent Strokes." His candidacy was half-serious, put up by a newspaper publisher to express his disdain for the recall of a governor re-elected only a year before. Coleman finished with 14,235 votes. Another 3300 votes and he would have wound up in seventh place, ahead of Hustler magazine publisher Larry Flynt. Hey, what do you want, it's California. Answer to yesterday's TOTN trivia question: Speaking of California, where Republicans may nominate women for both governor and senator in next week's primaries, the last time GOP voters of the same state nominated women for governor and the U.S. Senate in the same year was in 1998, when Hawaii Republicans picked Linda Lingle for governor and Crystal Young for senator. Both lost. The first time it happened was in 1994, in Maine, when Susan Collins (gov) and Olympia Snowe (sen) were nominated. Snowe won her race.